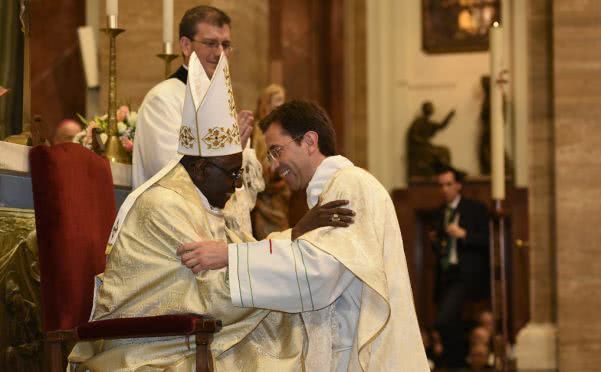 "Contemporary man goes to the priest seeking Christ," Cardinal Robert Sarah said in his homily at the May 5 ordination ceremony for 31 new priests of the Prelature. Dabo vobis pastores iuxta cor meum et pascent vos scientia et doctrina (Jer 3:15), “I will give you shepherds after my own heart, who will feed you with knowledge and understanding.” We have begun this solemn celebration with these words filled with trust in God. God is giving us these 31 deacons as shepherds, coming from various countries, who today are receiving priestly ordination. I am grateful to the Prelate of Opus Dei for granting me the great honor and marvelous gift of being the ordaining bishop in this ceremony. Dear ordinands: you have all been called by God, as we prayed in the collect prayer: “God our Lord, you have wanted to make use of the ministry of priests to guide and govern your people: grant that they may untiringly fulfil your will.” And in the prayer of ordination we are reminded that, just as God gave the apostles co-workers, now, as a help for our limitations, he is giving us co-workers for the exercise of the apostolic priesthood (cf. prayer of ordination). In Matthew’s gospel we read that Jesus called to him his twelve disciples and gave them authority over unclean spirits, to cast them out, and to heal every disease and every infirmity (Mt 10:1). The Spirit of the Lord will also descend upon you (cf. Is 61:1), and your hands will be anointed with the holy chrism, which will be for you strength and assistance to be able to sanctify the Christian people and offer to God the Eucharistic sacrifice (cf. Roman Pontifical, anointing of the hands). You have been chosen by God and you have put great care into your preparation, through many years of study. But above all it has been through prayer and silent contemplation that you have prepared for this extraordinary moment when, by the grace of ordination to the sacred priesthood, you will be configured with the Person of Christ the Eternal High Priest. Through the instrument of my unworthy hands you will be consecrated priests of God. We can ask ourselves this simple question: what exactly is a priest? The Bible presents the priest as a man of the Word of God. A man chosen and sent by God: As the Father has sent me, even so I send you (Jn 20:21). Go therefore and make disciples of all nations, baptizing them in the name of the Father and of the Son and of the Holy Spirit, teaching them to observe all that I have commanded you (Mt 28:19-20). As the second reading says, we priests are ambassadors for Christ, God making his appeal through us (2 Cor 5:20). And since we are sent, what are we to teach? Only the Word of God, the doctrinal and moral teaching of the Church, the truth about God, Christ and mankind. We are priests only to announce Christ. People today ask the priest to show them Christ. About other topics (whether economic, social or political) they have so many other competent persons they can consult. Contemporary man goes to the priest seeking Christ. The liturgy of the Word shows the priest that he is a teacher of the faith. We do not create the faith; the faith is always a gift of God, whether we understand it as an infused theological virtue or as the doctrinal content, that is, what should be firmly believed, without any hesitation or confusion. The priest is a preacher of the truth. He speaks with charity and, at the same time, with true freedom, despite any consequences that may befall him. In Sacred Scripture, the priest is also presented as the man of pardon: If you forgive the sins of any, they are forgiven; if you retain the sins of any, they are retained (Jn 20:23). In priestly ordination, the Holy Spirit is given to enable the person being ordained to carry out the same actions as Christ, and to be not only alter Christus, another Christ, but ipse Christus, Christ himself. The priest is today the visible and tangible expression of Jesus, Priest, Judge and Doctor of souls. The Holy Curé of Ars said: “The priesthood is the love of the heart of Jesus. When you see the priest, you should think of our Lord Jesus Christ.” Like the Curé of Ars, like Padre Pío, the priest is the apostle of the confessional, as Pope Francis reminded us a few days ago, during his pastoral visit to San Giovanni Rotondo (17 March 2018). The priest should also be seen as the friend of Christ: You are my friends if you do what I command you. No longer do I call you servants … but I have called you friends, for all that I have heard from my Father I have made known to you (Jn 15:14-15). Moreover, the priest is known essentially as a man of the Eucharist: Do this in memory of me (Lk 22:19). The priest is, above all, a man of the Eucharist. 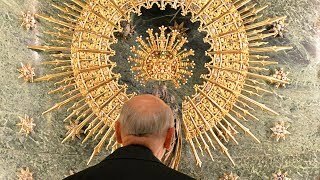 I would like to cite here some words of Saint John Paul II that are filled with deep meaning, on the priest’s relationship with the Eucharist: “The priesthood, in its deepest reality, is the priesthood of Christ. It is Christ who offers himself, his Body and Blood, in sacrifice to God the Father, and by this sacrifice makes righteous in the Father’s eyes all mankind, and, indirectly, all creation. The priest, in his daily celebration of the Eucharist, goes to the very heart of this mystery. For this reason, the celebration of the Eucharist must be the most important moment of the priest’s day, the center of his life ... The priest truly acts in persona Christi. What Christ accomplished on the altar of the cross and what earlier still He had instituted as a sacrament in the Upper Room, the priest now renews by the power of the Holy Spirit. At this moment the priest is as it were embraced by the power of the Holy Spirit, and the words which he utters have the same efficacy as those spoken by Christ at the Last Supper” (John Paul II, Gift and Mystery, pp. 75-77). As you can see, dear ordinands, there is no Eucharist without the priesthood, just as there is no priesthood without the Eucharist. But above all, there is no priesthood without a complete immersion in the intimate love of the Most Holy Trinity, fully present in the Eucharistic sacrifice. We will always have the need to rediscover our priesthood in the light of the Eucharist! As well as to help the Christian people to rediscover this treasure, in the daily celebration of Holy Mass, and especially in the solemn Sunday celebration. Each day we need the Eucharist to live out our priesthood and to be daring messengers of the Gospel in the midst of the sufferings, difficulties and hostilities that we encounter, and that should never overwhelm us. Finally, the priest should be a man of deep and intense interior life and prayer. He should be holy in order to help the people of God to be be holy. Sanctify them in the truth; thy word is truth. As thou didst send me into the world, so I have sent them into the world. And for their sake I consecrate myself, that they also may be sanctified in truth (Jn 17-19). Our Lord asks that we be sanctified, that we be consecrated to the truth. And He sends us forth to continue his own mission. How marvelous it is to see that Jesus sanctified himself not only for himself, but also for his disciples. And the disciples, in turn, should be holy not only for themselves, but also with a view to the Church and to all those who will believe in Christ after hearing his word. Saint Josemaria also reminds us of our imperative calling to sanctity. As he wrote: “We are deeply moved, and our hearts profoundly shaken, when we listen attentively to that cry of St Paul: ‘This is God’s will for you, your sanctification’ (1 Thess 4:3). Today, once again, I set myself this goal and I also remind you and all mankind: this is God’s Will for us, that we be saints. In order to bring peace, genuine peace, to souls; in order to transform the earth and to seek God our Lord in the world and through the things of the world, personal sanctity is indispensable … The path that leads to holiness is the path of prayer; and prayer ought to take root and grow in the soul little by little, like the tiny seed which later develops into a tree with many branches” (Friends of God, nos. 294-295). Above all, we priests and bishops need to be holy. Fulton Sheen said: “The mirror reflects the light of the sun but does not create it. Sanctity is a pyramid: Gracious as balm poured on the head till it flows down on to the beard; balm that flowed down Aaron’s beard, and reached the very skirts of his robe (Ps 133:2). God is holy; that holiness comes to earth in Christ. Christ bestows it on His priests with their cooperation; they, in the measure in which they accept, contribute to making the people holy" (from Fulton J. Sheen, The Priest Is Not His Own). Dear ordinands, you will realize that our sanctification cannot take place without contemplating, touching and living fully and physically the complete offering of our body through the great mystery of priestly ordination, an offering expressed in Saint Paul’s powerful words: I have been crucified with Christ; it is no longer I who live, but Christ who lives in me; and the life I now live in the flesh I live by faith in the Son of God, who loved me and gave himself for me (Gal 2:20). Our priesthood will be fully made a reality if we accept dying each day on the Cross with Jesus. Therefore, if you truly want to become holy priests, listen attentively to Saint Peter Chrysologus’ words urging us to pray always and to offer our bodies to God. “Each of us is called to be both a sacrifice to God and his priest. Do not forfeit what divine authority confers on you. Put on the garment of holiness, gird yourself with the belt of chastity. Let Christ be your helmet, let the cross on your forehead be your unfailing protection. Your breastplate should be the knowledge of God that he himself has given you. Keep burning continually the sweet smelling incense of prayer. Take up the sword of the Spirit. Let your heart be an altar. Then, with full confidence in God, present your body for sacrifice” (Saint Peter Chrysologus, Sermon 108: PL 52, 499-500). Dear ordinands, never forget that you are receiving priestly ordination to serve the Church and all souls. As you learned from Saint Josemaria and his successors, always be very loyal to the Roman Pontiff, to the bishops, successors of the Apostles, and to your Prelate. Love the priests in each diocese; beg the Lord constantly to send many laborers for his harvest, to send many holy priests, as guardians to feed the church of God, which he obtained with his own blood (Acts 20:28). I want to congratulate the parents and brothers and sisters of the new priests. From today on, you will have someone with your own blood interceding for you before God. At the same time, we all need to pray for them even more than before, since the responsibility they have taken on is great. We are in the month of May. How often we will have gone to our Lady to tell her things! How forcefully we will have begged her to help us, as the Mother of God and our Mother! Let us entrust these brothers of ours to Mary, Mother of the Church, Mother of priests. May our Lady welcome them especially as her dearly beloved sons, just as she welcomed Saint John, the beloved disciple, next to Jesus’ Cross. Dear ordinands, I want to give each of you a rosary and a small icon of Our Lady of Tenderness, so that you may unite yourselves more closely to Holy Mary and in order to oblige you, in some way, to pray for me. May God bless you.